I apologize for the length of this post, but if you stick with it, I hope you will find it to be worth your time. It was a raining Chicago day today. So I took the bus home (and I am so glad I did). At the Moody Bible College bus stop, two young women - probably 18 to 25 - hopped on the bus looking like classic home-schoolers. If you are unfamiliar with this look, think ankle-length corduroy skirts, bleached jean jackets, and matching hand-knit scarves, hats, and mittens. They sat next to me and spoke unusually loud for bus conversation. I easily overheard all they said (without trying). One of the girls was apparently flying out of O'hare and the other was accompanying her since she was afraid to take the "el" alone. Adorable. Then came the good part. Right before they got off the bus to transfer to the blue line, one of the girls took something out of her purse and set it on the seat next to her (and next to me). I looked at it and my eyes widened. It was a pamphlet! A apologetic, evangelistic tract! And it was wonderful. "The Atheist Test." Apparently based on a book by Ray Comfort, it was filled with arguments that will convert atheists to Christianity. In it's quest to convince atheists, it brimmed with unintentional humor. Has outward indicators of inward contents: Green--too early, Yellow--just right, Black--too late. Now if that didn't just convert you to Christianity, I don't know what else possibly could. I was ecstatic with this new approach to converting the pagans. I was also hungry for a banana. So I went home, opened up the fridge, and grabbed some fruit. Unfortunately, I grabbed a coconut. I was struck with sudden despair. Where was the perforates tab? Where was the "ease of entry"*? Was the coconut the theist's nightmare? How could a there be a god if a piece of fruit is difficult to eat? I put the coconut down, deciding that I would ponder the coconut another day. I turned the page, hoping for some argument to revive my shattered faith. This page contained a quiz with "yes" or "no" boxes and "yes" or "no" questions by them. Question #1: "From the atom to the universe is there order?" Question #2: "Did it happen by accident or must there have been an intelligent mind?" Uh oh. I was stumped. Do I check "yes" or "no"? 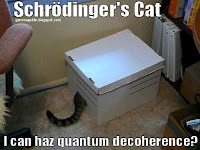 My head hadn't hurt that much since I read about Schrodinger's cat. I checked "yes, it did happen by accident or there must have been an intelligent mind." Next question. Question #3: "What are the odds of 50 oranges falling by chance into ten rows of five oranges?" Again, this pamphlet was too smart for me. Was I supposed to be able to do this math in my head? I wanted more information. I found myself wondering: "How high were the oranges dropped? Did they have time to reach maximum velocity? What is the terminal velocity of an orange anyway? Were these oranges dropped individually or as a group? What about the contours of the ground - smooth or rough? Why am I still reading this pamphlet?" That last question struck me the hardest. I put the pamphlet down and went to eat a banana (green - TOO EARLY!). From now on, I'll spend my mental energies on something more simplistic. Rick Perry advertisements, here I come! In the end, I have realized that some mysteries, like the coconut, are best left unsolved. *I could easily have written a trashy blog-post about the double-entendre or innuendo in many of the points. If those points escaped you, read the banana arguments again. Still not getting it, congratulations on the purity of your mind! Just to prove that it's real. I am what you would call a convinced Christian, but these types of arguments have nothing to do with following Christ. Hahaha! I love this. When I first read it, I also was instantly reminded of, oh, the other naughties the pamphlet could have been referencing. Glad I got my mind cleaned up and read the whole post... hilarious, as usual. Loved it. I was scrolling through Next Blogs, bored silly, until I came upon this post. Thanks! The Designer of the Coconut Universe is a fallen demon... that's why it is how it is, like evil! Best blog I've run across today. This post reeks of common sense and awesome. Well done. Oh this was nothing short of delightful. Thank you for sharing. Ha very nice post. Gave me a much needed giggle. Your blog has given me beautiful insights on so many things. Keep up the good work. I just stumbled onto your site. Thank you for this post, I'm sharing it all the hell over Facebook and subscribing. One of my favorite quotes lately came from a picture. 2 hands holding a fortune with the broken cookie in the background. What did it say? "I cannot help you for I am just a cookie." Don't know why but it seemed to go with the coconut. I love to read so I love the long posts. Keep it up. SO glad i found this blog! It was lame to make an excuse that there is an intelligent being just because of the design of a banana. From the point of view of an evolutionist, living beings (including plants) evolved because they need to adapt. If a fruit evolved into something like a banana, the obvious factor is an environmental condition. Where do banana grow? How was its temperature out there? Why is it genetically engineered to be that way? Was the nutrients involving the area responsible for its characteristics? There are a lot of factors. You can only assume that the coincidence of its shape and functions help humans, but are humans that dumb enough to not know how to eat the banana? So what about the monkeys and the other mammalians who can easily eat a banana? Was the banana also designed for them? So how about the other vegetation and fruits that are not easy to eat? was it forbidden to eat? Was it poisonous? Surely it was the way of nature that some are poisonous because it looks suspicious and hard to eat but assumptions can only lead to misunderstanding. Not fully knowing something will make doubts. This way of thinking are the patterns of the ancients and that is why tribes cannot easily adopt to change because they fixed an idea to their narrow minds. They want routines and afraid of being dynamic. My conclusion of this argument is, just because it was designed for efficiency doesn't conclude that there is a creator. Sometimes, nature itself created it, and it was processed for thousands of years. I specifically believe in God, but there are things that we cannot possibly explain. So explaining the unexplainable will only backfire to your own religion. God does not intervene, As for my belief; He gives only opportunities. STumbled upon your blog and am loving it! HEY! I was home schooled!!! Don't judge us! Very enjoyable post! Cracked me up and made some good points in the process. Keep writing! well done sir. Only Wish Google would allow me to follow you. AhhhhHahahaha! My parents made me sit through 3 excruciating months of Ray "banana man" Comfort's bull-shittery several years ago. This post is gold. What a lovely blog, I really enjoyed reading it. I too have a new blog, and I would appreciate it if you could visit Γαστρεντερολόγοι Θεσσαλονίκη The blog provides information on various gastrointestinal diseases and has a forum with questions and answers for patients with problems of stomach, intestines, and liver. 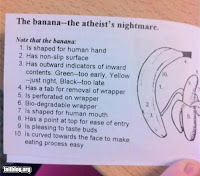 t was lame to make an excuse that there is an intelligent being just because of the design of a banana. From the point of view of an evolutionist, living beings (including plants) evolved because they need to adapt. 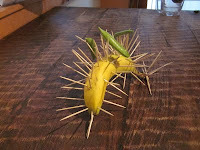 If a fruit evolved into something like a banana, the obvious factor is an environmental condition. Where do banana grow? How was its temperature out there? Why is it genetically engineered to be that way? Was the nutrients involving the area responsible for its characteristics? There are a lot of factors. hey..awesome!! you have a nice blog! do u want to make money writing a blog !! exactly the same thing you do, you get paid!! come join me!! make money! Christians are a fun bunch. I enjoyed your comments.